My dear readers, I apologise. Especially seeing as my wine stocks are were at an all time high. 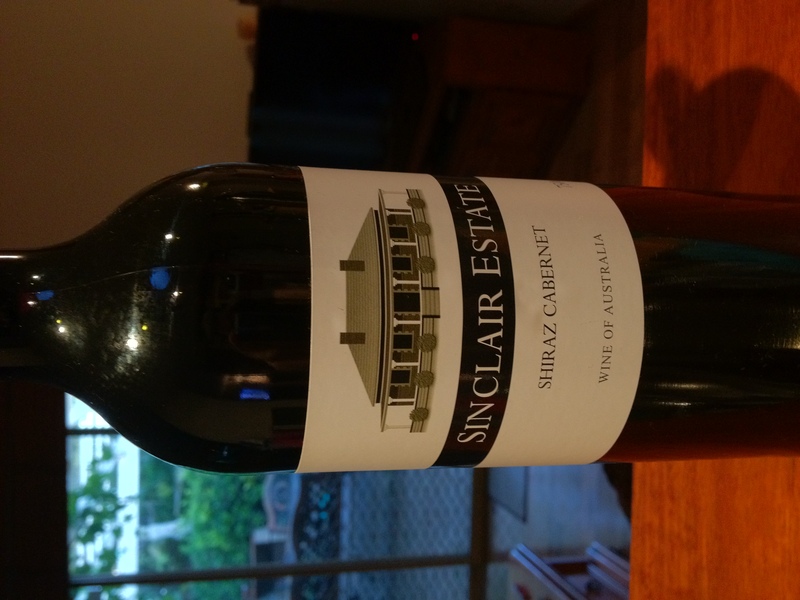 So, without further ado, I give you 2010 Sinclair Estate Shiraz Cabernet. I got this wine with a couple of cases of red from redeeming my credit card points. I know, what better reward for spending money! I did have to concede a set of saucepans for Jay (as she loves to tinker in the kitchen) and some new phones for the house as the old one was terrible, but I still managed to score at least 50 bottles of tasty red wine. Presentation. Plain, unpretentious, a bit boring. Yes, come on, you can do better than this! Taste smooooth! This is a very drinkable wine (aren’t they all?) – good enough for a posh dinner, but not so good you feel guilty about drinking it during the week (just as well really, it’s not even hump day yet – yes, I’m writing this early as I wanted, no needed a glass within 10 minutes of getting home). Anyway, back to the taste – tt’s got the peppery fruit of the shiraz and the sweetness of the cab in a good mix – both kinda even each other out and don’t overpower, which I think makes it perfect for just getting on with the drinking bit. Aftertaste (what do you call this in wine lingo – finish?) – warm, almost syrupy but without the sweetness – plum and blackcurranty. Slightly spicy. Nice. Verdict Good – not earth shattering ‘omg I should really have saved this for a firstborn son’ good, though, but perfectly respectable. If you took it to a dinner party, your hosts wouldn’t be disappointed. Unless they’re serving fish. You’d want to be eating red meat or at the very least a rich dark pasta. hehe – you so should have a wine cellar – I’d love a proper underground one with a tasting station, but lacking the requisite millions, I’ll have to made do with a wine rack and the kitchen bench!